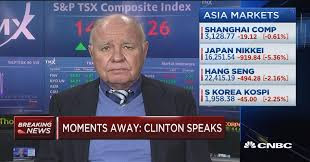 Marc Faber: Well, I think that in terms of the economy I don’t think the economy is as strong as people believe or as the statistics would show and recent trends have rather been indicating some weakness is auto sales, not a particularly strong housing market and we have several problems as a result of excessive credit. So, I think that the economy is not going to do as well as people expect and concerning the huge infrastructure expenditure that Mr. Trump has been talking about, it is about a trillion dollars over ten years, maximum. In other words, a hundred billion a year.